Preston North End's Callum Robinson. PRESTON NORTH END will be without the services of in-form attacker Callum Robinson for the next three months. The Championship club have confirmed that Robinson suffered a torn hamstring during Saturday’s 4-1 win over Blackburn Rovers. The Republic of Ireland international has been in superb form for his club this season, scoring for the ninth time in his last 13 appearances before being injured in the game at Deepdale. “Callum is going to be out for a minimum of three months, and we will get an opinion on that this week as to whether he will need surgery,” Preston manager Alex Neil told a news conference this morning. “It’s really bad news for everyone connected with the club because he has been our talisman this year. It’s the first real injury of his career and naturally he’s gutted, and we are all gutted for him. The English-born forward, who qualifies to play for Ireland via his grandmother from Monaghan, made his senior international debut against Wales in September. Robinson has gone on to win six caps, with the 23-year-old’s emergence proving to be one of the few positive aspects of Ireland’s inaugural Uefa Nations League campaign. He’s the second Irish player at Preston to be sidelined until 2019 due to a hamstring injury. Sean Maguire was forced to hobble off in the recent friendly against Northern Ireland. After the win against Blackburn, Alex Neil suggested that Robinson’s commitments to his country may have been responsible for his injury problems. His statement echoed comments he made earlier in the week regarding Maguire’s setback. With the Euro 2020 qualifiers scheduled to kick off on 21 March, new Ireland manager Mick McCarthy will be hoping that the recovery process runs smoothly for both Robinson and Maguire. Email “Another Irish blow for Preston as 3-month lay-off is confirmed for Callum Robinson”. 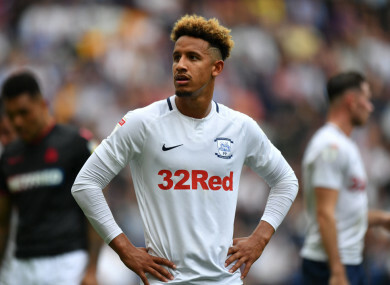 Feedback on “Another Irish blow for Preston as 3-month lay-off is confirmed for Callum Robinson”.